Don’t miss this year’s new look Sleaford Christmas Market, taking place between 11am and 5pm on Sunday. There will be lots to see with over 100 stalls and entertainment in the Market Place, Eastgate car park, the Town Hall and Navigation Yard with additional attractions laid on by businesses. 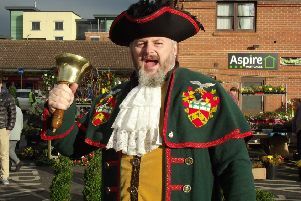 The Market will be officially opened at 11am on stage in the Market Place by the Mayor of Sleaford Coun Grenville Jackson, the Town Crier John Griffiths and Rev Philip Johnson of St Denys’ Church. Meet reindeer and their handlers outside the Town Hall, from 11am to 3pm and Father Christmas and his sleigh. All donations will go to the Indonesia Tsunami Appeal through the Sleaford Kesteven Rotary Club. Fixter’s Falconry with their amazing birds will also be outside the Town Hall. There will be a balloon artist and kids entertainer and a mobile drinks bar serving up cocktails, prosecco and Pimms. El Toro tapas bar in the Market Place will open from 10am, showing Christmas movies, running prize contests for the air ambulance. In The Bristol Arcade there is Santa’s Grotto, live music, stalls and a chocolate making demonstration, while over at Millstream Square from 11am until 2pm there is music from Matty Haynes, mulled wine and mince pies and children can have a selfie with an ‘Avenger’. Proceeds go to the air ambulance. White Hart Mews will also be having stalls and music, the Museum will be holding ‘Rudolph’s Victorian Christmas’, the Methodist Church will have their spectacular annual Christmas Tree Festival and the Children’s Centre in Money’s Yard and The Source will both be holding events. The Town’s Christingle service will take place in St Denys’ Church at 3pm - everyone welcome. All children are invited to collect a battery operated tea light from the Sleaford Town Council gazebo by the stage in the Market Place (limited tea lights will be available, so it is first come, first served to avoid disappointment. One tea light per child). Bring a jar to put the tealight in and your child can then make their way to the Market Place ready for the Christmas lights to be switched on. The Christmas lights will be switched on in the Market Place at approximately 4.15pm, once the Church Christingle Service has finished. The Mayor of Sleaford will be selecting a boy and a girl to join him on stage to push down the plunger to turn the lights on, with a countdown from Lincs FM. There are 112 stall pitches booked overall with food and drink to purchase in both the Market Place and Eastgate Car Park and both sites will have benches, so that visitors can relax to sit down and eat and drink. One NK’s climbing wall will be in Eastgate Car Park, on the side of the green. There will also be games stalls on the green consisting of a bouncy castle (weather permitting), an activity zone, a toy stall, hook a duck, shoot the sweets, score under 21, penalty shoot out and mini waltzers. The sound and games for the day will be provided on stage in the Market Place by Express Entertainments and will be joined later on by Lincs FM. There will be a buggy park outside the Town Hall for people to leave their pushchairs outside if they wish to (please remove any valuables and all pushchairs will be left at the owner’s liability). The Lost Children Point will be in the conservatory area of the Town Hall and the First Aid Point will be near the tractor shed in Eastgate Car Park. Security and First Aid on the day will be provided by the team at Aurora. Eastgate Car Park and the Market Place Car Park will be closed for parking from midnight all through Sunday. The Town Council have not applied for any road closures for the market.